Identification of participants: 1. Rudolf L. Mössbauer (ILL, Grenoble, France), 2. Sagrario Martínez-Carrera (CSIC, Madrid, Spain), 3. Dorothy Hodgkin, 4. Sidney C. Abrahams, 5. Severino García-Blanco (CSIC, Madrid, Spain), 6. ?, 7. Rafael Márquez Delgado (University of Seville, Spain), 8. ?, 9. ?, 10. Concepción Foces-Foces (CSIC, Madrid, Spain), 11. Áurea Perales Alcón (CSIC, Madrid, Spain), 12. G. Kartha (Center for Crystallographic Research, Memorial Institute, Buffalo, USA), 13. Pilar Smith Verdier (CSIC, Madrid, Spain), 14. Esperanza Moreno Echevarría (CSIC, Seville, Spain), 15. Alejandro Conde Amiano (University of Seville, Spain), 16. ?, 17. ?, 18. Gabriella Bombieri (University of Milan, Italy), 19. Mario Mammi (University of Padova, Italy), 20. Jim Trotter (University of British Columbia, Canada), 21. [a former J. M. Robertson student]?, 22. Sivaraj Ramaseshan (National Aeronautical Lab., Bangalore, India), 23. Mogens S. Lehmann (ILL), 24. ?, 25. ?, 26. ?, 27. Pekka Suortti - (Helsinki), 28. ?, 29. ?, 30. ?, 31. ?, 32. ?, 33. Massimo Marezio (CNRS, France), 34. ?, 35. ?, 36. Simeón Pérez-Garrido (CSIC, Seville, Spain), 37. Amparo López-Castro (CSIC, Seville, Spain), 38. ?, 39. ?, 40. Paul Beurskens (University of Nijmegen, The Netherlands), 41. ?, 42. ?, 43. Rafael Jiménez Garay (University of Seville, Spain), 44. Michael Hart (University of Bristol, England), 45. ?, 46. Dennis W. Engel (Bloemfontein, later Durban), 47. ?, 48. ?, 49. ?, 50. Gastone Gilli (University of Ferrara, Italy), 51. ?, 52. Joaquin Solans Huguet (University of Barcelona, Spain), 53. José L. Amorós Portolés (University Complutense of Madrid, Spain), 54. Fritz Anton Schröder (University of Freiburg, Germany), 55. ?, 56. Cullie J. Sparks (Oak Ridge National Lab., Tennessee, USA), 57. John M. Cowley (Arizona State University, USA), 58. ?, 59. ?, 60. Ben Post (Polytechnic Institute, New York, USA), 61. [Aafje Vos (Laboratorium voor Strukturchemie, Groningen, The Netherlands)]?, 62. ?, 63. ?, 64. ?, 65. Tom F. Koetzle (Brookhaven Nat. Lab., New York, USA), 66. Jesús Tornero (Autonomous University of Madrid, Spain), 67. Ramón Coy-Yll (University of Barcelona, Spain), 68. ?, 69. ?, 70. ?, 71. Lyle H. Jensen (University of Washington, USA), 72. Arthur J.C. Wilson (University of Birmingham, UK), 73. ?, 74. Sax Mason (ILL, France), 75. ?. 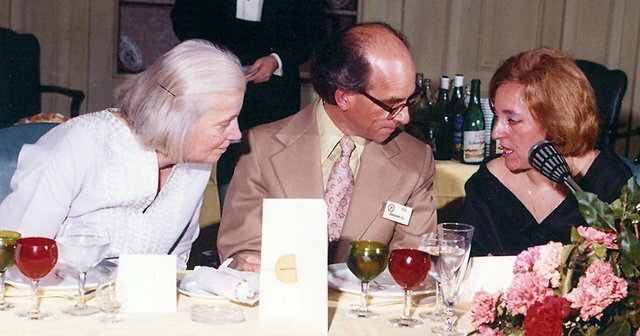 Dorothy Hodgkin, Sidney Abrahams, Sagrario Martínez-Carrera.